i recently found the website mint (via for me, for you). it's a free personal finance manager. and it's so fun! 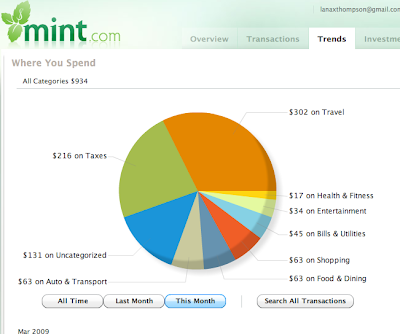 For a girl who loves math, and all things charts and graphs, it's really fun (and helpful) to see where I'm spending my money. It's super easy to set up too. woo woo! I tried Mint and it seemed cool, but I never really followed through with it. Let me know if you like it enough to stick with it.